I don’t normally feature guest posts on my site, but I recently came across the work of Dr. Lam and as someone who has struggled personally with adrenal fatigue and now helps people professionally to feel better, I wanted to share this important post with my community. You can learn more about the author, Dr. Lam, in his bio below. Going out for a fast-paced run at dawn, biking with a friend on the weekends, or even taking a trip to the wilderness for a mountain hike could sound exciting. Physical activity in and of itself is remarkable and helps you build muscle, improve your blood circulation, enhance your mood, and burn calories. It helps reduce stress levels, improve oxygen and respiratory health, balance cortisol, blood glucose, thyroid, and growth hormones, and is linked to enhanced mood. However, as essential as exercise is for you, if you are trying to manage Adrenal Fatigue Syndrome (AFS), over-exercising could potentially lead to an adrenal crash. When you are dealing with AFS, especially the advanced stages, you need to be cautious of the types and duration of exercises you engage in. Proper nutrition, good-quality sleep, and wise lifestyle habits all go hand in hand with a well-balanced exercise program to put you on the path to managing your AFS. As crucial as exercise is for long-term optimum health, moderation is the key. Do not engage in vigorous physical activity if you have advanced-stage AFS. The more advanced your AFS is, the more you should focus on calming exercises, such as breathing or stretches. Exercises that focus on the autonomic nervous system are best for recovery. If you happen to have reactive hypoglycemia, a challenge in balancing blood sugar, you may experience excessive fatigue, dizziness, anxiety, and overall feel drained. Hypoglycemia ordinarily occurs in advanced stages of AFS, and with hypoglycemia especially you should be cautious of vigorous exercise, for it may have a negative impact on your body. While abstaining from exercise is not healthy, over-exercise could be just as unhealthy if you are in an advanced stage of adrenal fatigue and experience very low energy levels, as it could lead to adrenal crashes and a worsened condition. Having AFS means experiencing chronic fatigue and weakness, and this is due to your body being imbalanced. Your cortisol and adrenaline hormones are imbalanced, and the excessive amount of hormones being pumped from your adrenal glands disrupts your NeuroEndoMetabolic (NEM) Stress Response system. The NEM is a self-regulated system in your body that protects your body from excessive stress. When it is disrupted, your body eventually develops AFS, leading to symptoms of weakness, headaches, irritability, lack of sexual energy, and the inability to focus properly. While you may feel excited once your body starts having additional energy as you begin to exercise more, be careful not to over-exercise at this point in time. Managing AFS appropriately needs persistence, and your body may still not be capable of tolerating too much exercise yet. Over-exercise may exceed your body’s reserve capacity, leading it to crash and deteriorate. Try to focus not on how much exercise you get in, but how great you feel once your activity is over. You do not want to overwork your sympathetic nervous system, as your goal is to use exercise as a progressive healing tool. Do you have adrenal fatigue? For a natural approach to healing your body click HERE. What works for you might not work for everyone. Especially when it comes to AFS, it’s very clear that a personalized exercise routine is the best route to take. The intensity of your exercise, the length spent engaging in it, and the frequency, all depend on the stage of your AFS and your energy levels. Overworking your body could cause you to crash and end up in a worse energy state than before. Be sure to talk to your healthcare professional, and discuss how you can add exercise to your routine to manage your AFS better. You may begin with exercises that don’t actually reduce your energy, but that focus on increasing the flow of energy from within. Some people may have to start with very simple and calming exercises, like adrenal breathing. It’s absolutely necessary that you take gradual steps to allow your vital organs to overcome the low energy state many with AFS are in. Remember, it’s not about how much exercise you do, but how helpful the exercise you complete is in energizing and refreshing you. Breathing is an automatic function that you may overlook or under-appreciate. However, proper breathing can do wonders in terms of increasing energy flow and strengthening your organs and body overall. In fact, you may not be breathing properly right now, and this in and of itself could play a role in the condition of your health. Learning breathing techniques could allow you to influence your heart rate, better the condition of your intercostal and abdominal muscles, relax your body, and improve your nervous system health. Proper breathing could reduce your stress and increase your blood flow. In fact, more and more research is linking the benefits of yoga with improved health. Breathing properly could do your health miracles, and yoga consists of the proper development of breathing, along with stretches. Yoga and deep breathing allow your sympathetic nervous system to release neurotransmitters like norepinephrine, helping to maintain homeostasis in your body. This improves your energy levels incredibly and puts you on track for healing from AFS. Whether you decide to begin yoga exercises or simply proper breathing, remember that more is not better, and that steady steps can go a long way. If your dream is to hike Mount Fuji, cycle across the country, or join a cross country team, work towards your goal with patience and persistence. Whether you have an advanced stage of AFS, or you are trying to manage AFS by working out, be sure to talk to a healthcare professional prior to adding exercise into your routine. Make better choices with your snacks and meals to balance your blood sugar, and progress towards better quality sleep. With persistence and patience, you will find yourself optimizing your AFS remarkably, and perhaps hiking Mount Fuji sometime in the near future. Michael Lam, M.D., M.P.H., A.B.A.A.M., is a western trained physician specializing in nutritional and anti-aging medicine. Dr. Lam received his Bachelor of Science degree from Oregon State University, and his Doctor of Medicine degree from the Loma Linda University School of Medicine in California. He also holds a Master’s degree in Public Health. He is board certified by the American Board of Anti-Aging Medicine where he has also served as a board examiner. He is an international best-selling author and has written seven books: Adrenal Fatigue Syndrome – Reclaim Your Energy and Vitality with Clinically Proven Natural Programs, Advanced Symptoms of Adrenal Fatigue Syndrome, Adrenal Fatigue Syndrome Cookbook, Estrogen Dominance, Beating Cancer with Natural Medicine, The Five Proven Secrets to Longevity, and How to Stay Young and Live Longer. In 2001, Dr. Lam established www.DrLam.com as a free, educational website on evidence-based alternative medicine for the public and for health professionals. Connect with Dr. Lam on Facebook, Pinterest, Twitter, Instagram, and Youtube. Next Step: Are You Ready To Boost Energy Naturally And FINALLY Feel Great Again? If You Want A step-by-step program that helps you heal adrenal fatigue naturally you are going to love my Fatigue Warrior program! 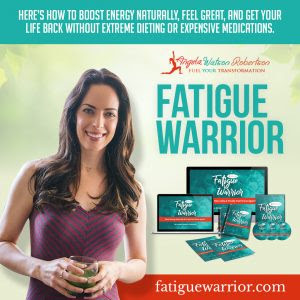 Join Angela’s Community & Get Access to your FREE Fatigue Warrior Guide: My 5 Step Solution to Fight Adrenal Fatigue Naturally and Get Your Life Back!